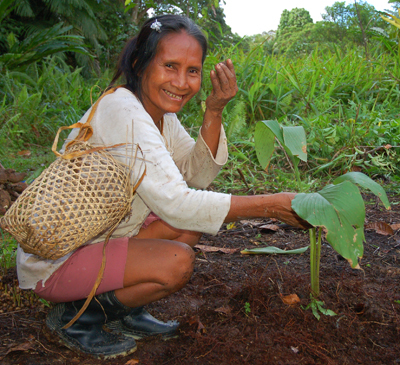 Give your support for Amazon conservation and communities a boost today with a donation to the Center for Amazon Community Ecology. 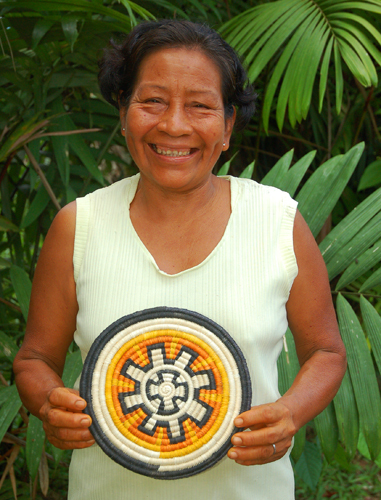 Donations made to CACE today after 9:00 am (EDT) through GlobalGiving at www.AmazonAlive.net will receive a 30% matching donation until matching funds run out. 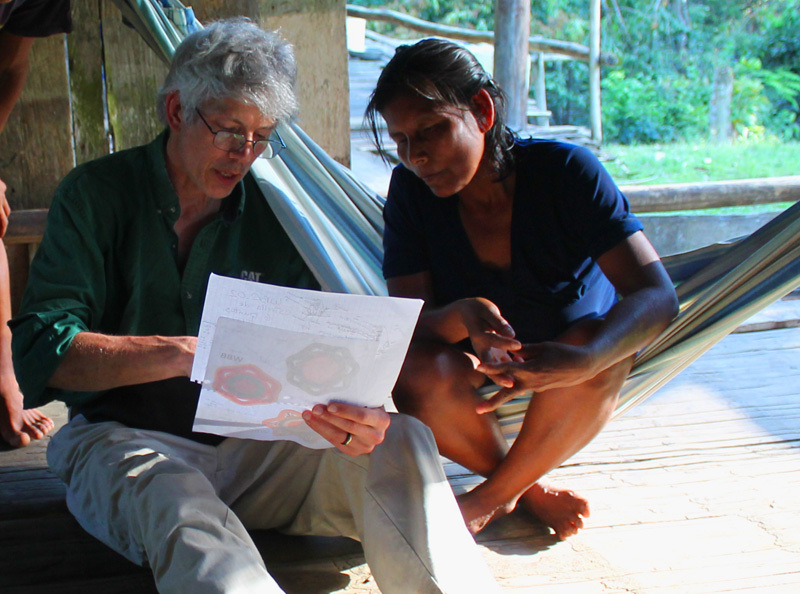 If you live in Iquitos, Peru, please come meet CACE director Dr. Campbell Plowden and project manager Yully Rojas at the Dawn on the Amazon Café on Tuesday, March 24 from 7:00 to 9:00 pm. 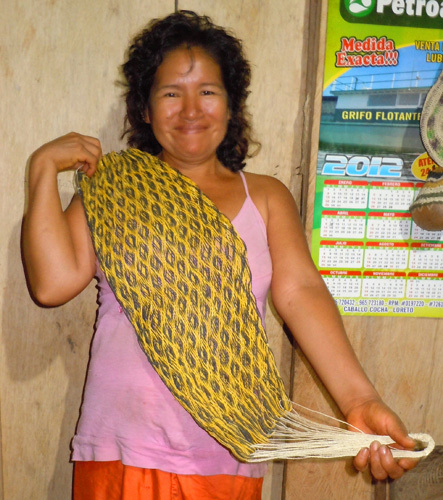 See photos below of a recent CACE artisan workshop, armadillo ornament, hot pad and belt made by artisans from Brillo Nuevo and Puca Urquillo. 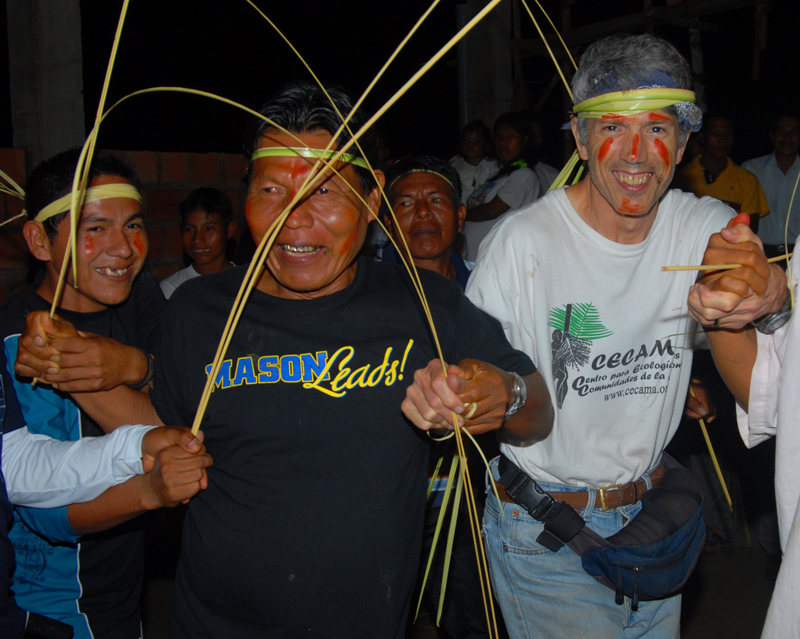 I just returned to Iquitos after a successful four day visit to the Maijuna native community of Nueva Vida in the Napo River region of the northern Peruvian Amazon. 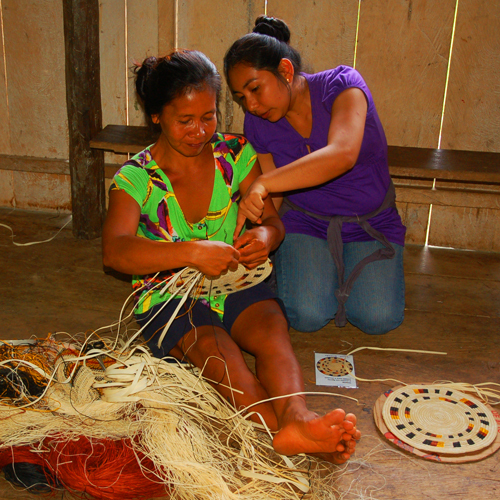 The main purpose of the trip was to meet their artisans and see if they wanted to work with CACE to develop and market several new models of handicrafts. 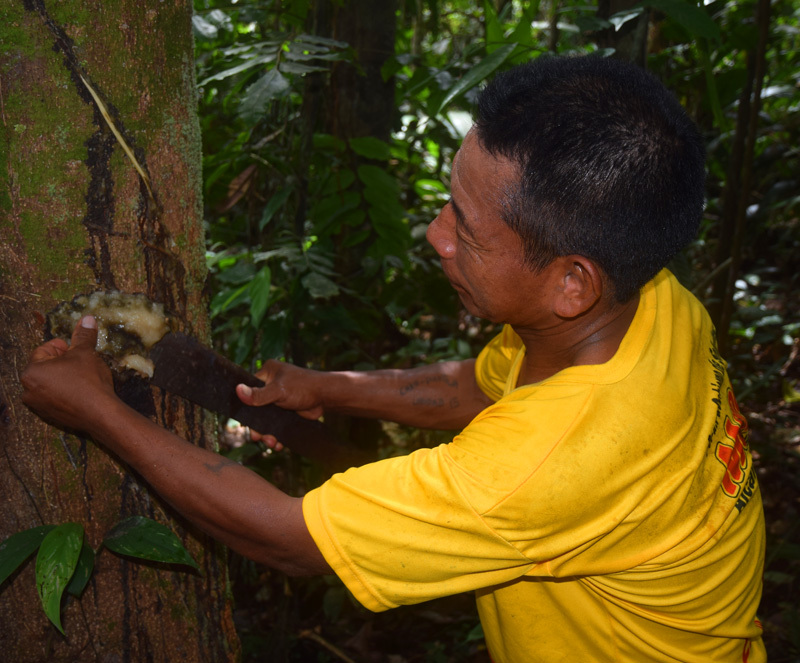 I also wanted to explore the potential for harvesting copal resin with them and distilling it into fragrant essential oil as a new source of sustainable income for the village. My journey began with a speedboat ride at dawn from Iquitos to the Amazon River town of Mazan with my CACE videographer companion Tulio Davila. After stocking up on supplies, we eventually met up with our Maijuna guides Everest and his father Sebastian “Shebaco” Rios Ochoa. I first met this friendly confident native leader through long-time Maijuna friend and CACE board member Michael Gilmore. 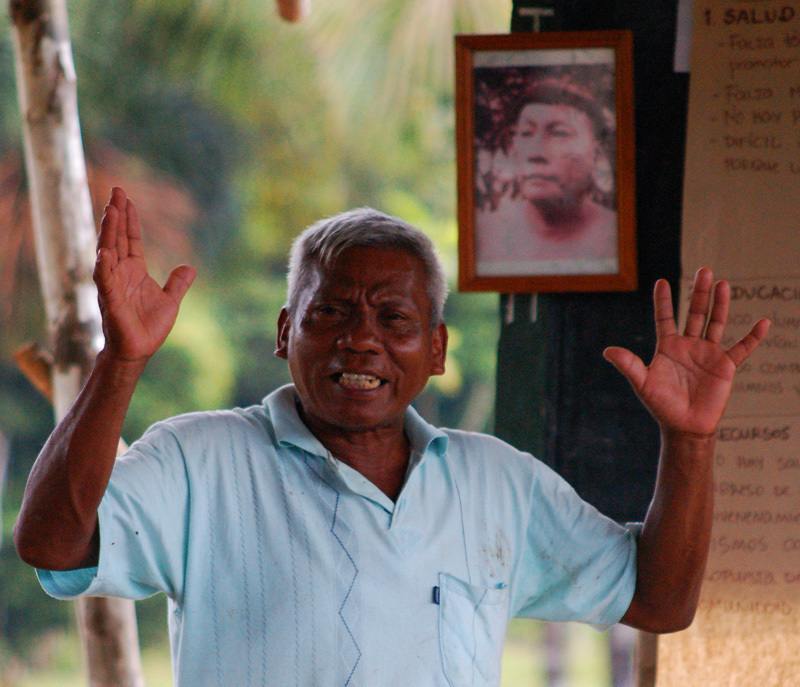 We had danced together after a Maijuna federation congress in 2009, and he hosted me last summer in Sucusari when we conducted a quick search for copal trees near his village. 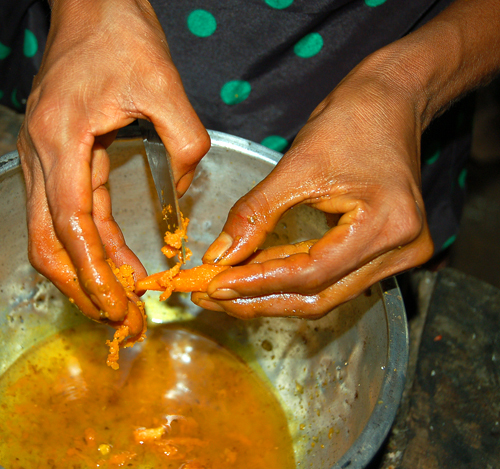 I much appreciate that he gave me the name “Baiyiri” – the Maijuna word for copal. Our original host for this visit was going to be Walter Perez from Nueva Vida, but on two days’ notice he had flown to Lima with two other Maijuna to meet with the Peruvian President. 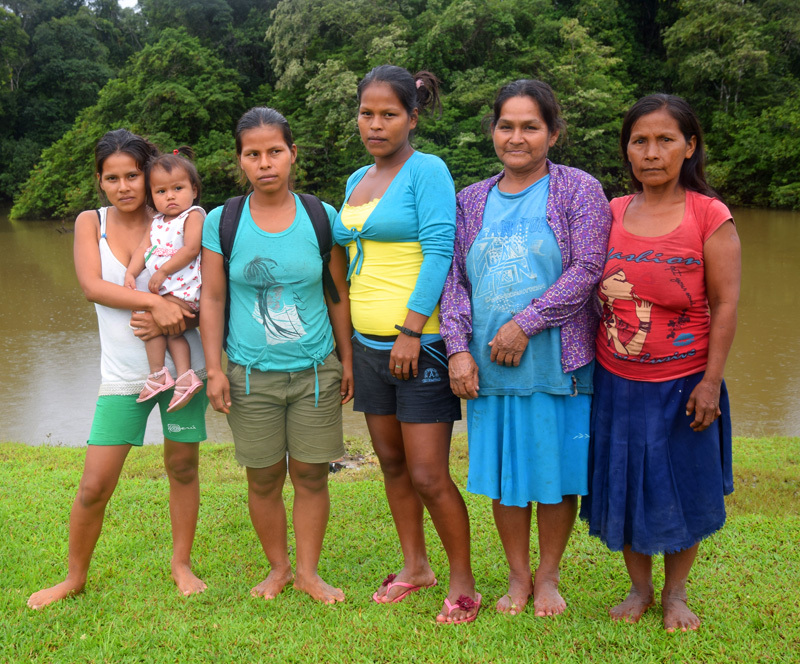 This was a critical meeting that marked the final hurdle to winning government approval for a regional protected area that would encompass the four main Maijuna villages in the Napo and Putumayo River region and the forest in between. This struggle to gain legal recognition for their traditional lands coincided with a multi-year battle against a road project that would go through the heart of it. I wished Walter well on his mission and was happy to have Shebaco with me again for mine. 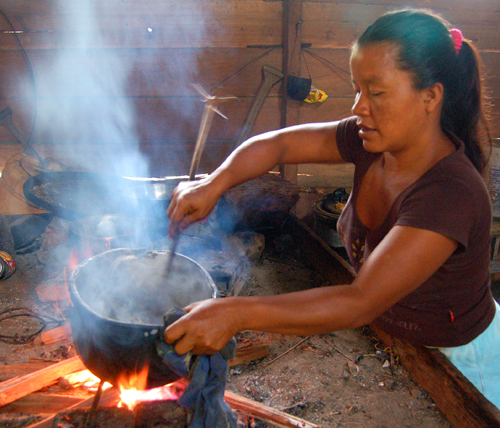 Like many native groups, the Maijuna are striving to improve their standard of living and standing in modern Peruvian society and maintain certain aspects of their culture that give them pride and sustenance. 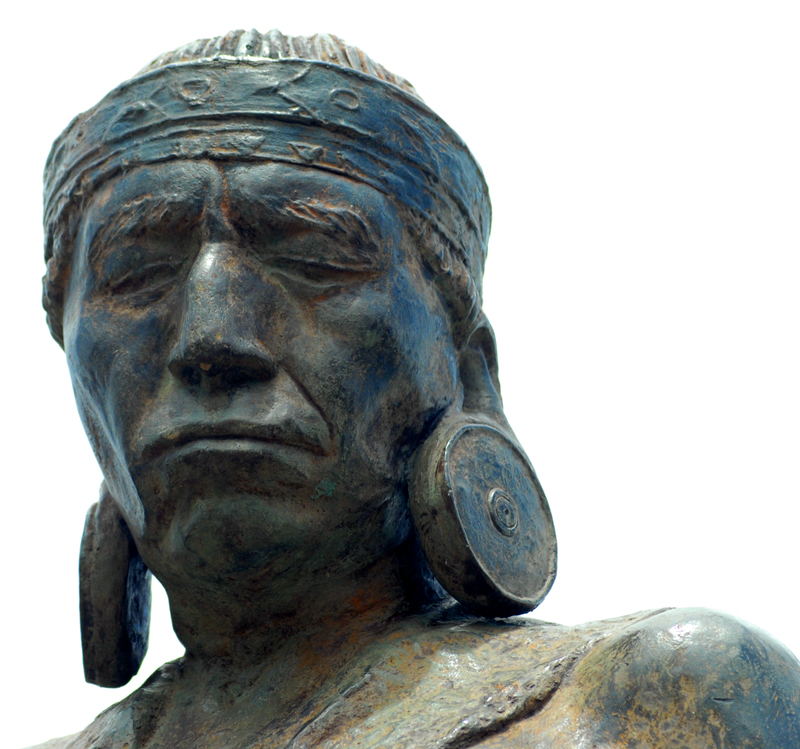 The Maijuna were once called by the derogatory term “orejones” (big ears) because they had the custom of placing increasingly larger disks into their ear lobes. They gave up this practice a generation ago, but they embraced a program led by linguists from U.C. Berkeley that has reinvigorated the teaching and use of the Maijuna language by all generations. 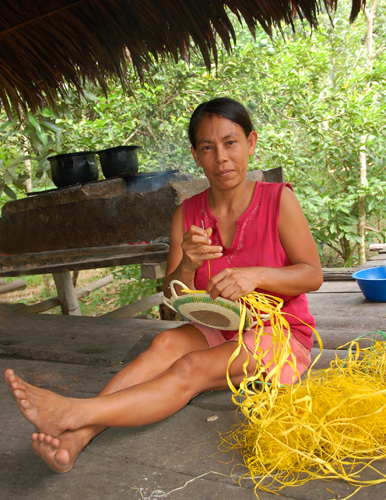 Half a dozen women from Nueva Vida learned how to make decorative baskets from chambira palm fiber that were similar to ones made by campesino artisans from the Tahuayo River, but their skills languished for several years because the workshop’s sponsors did not provide follow-up support to market any baskets they made. Since there was a new spark to this enterprise, Michael thought that this would be a propitious time to connect with these budding artisans. 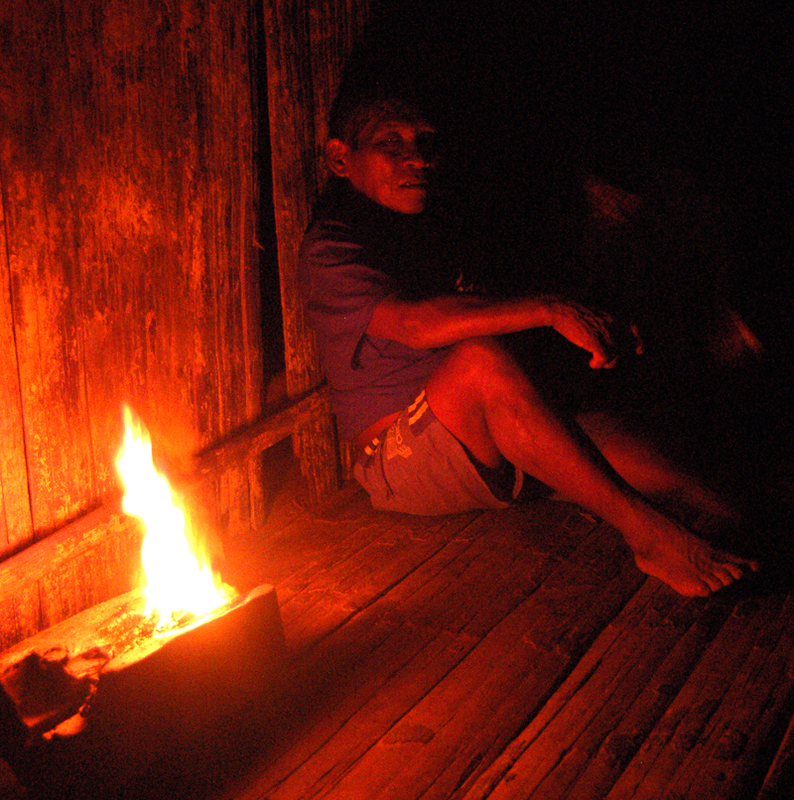 Due to our late start from Mazan, we didn’t get into Nueva Vida in Shebaco’s peque-peque (motor canoe) until well after dark. After setting up our tents in our host’s main room and a quick supper of tuna fish and crackers, we went to sleep. 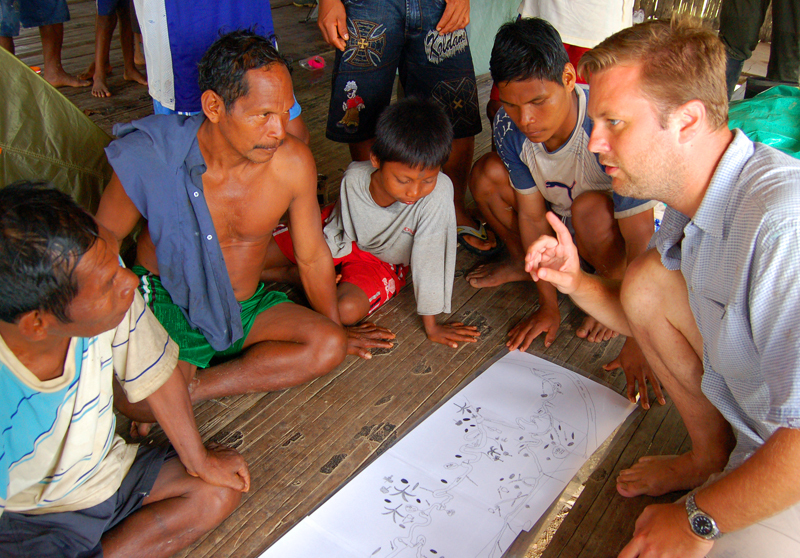 My visit began in earnest the next morning by meeting almost the whole community. 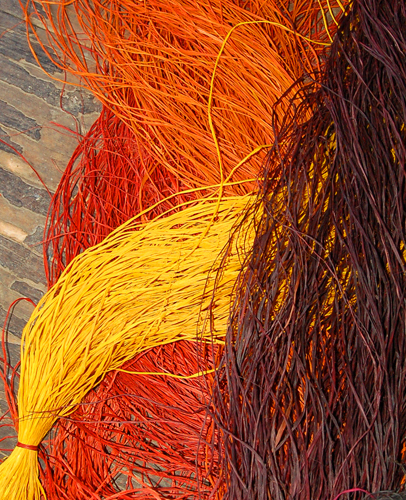 I spoke no Maijuna beyond my nickname, but showing and discussing a video of our handicraft project with other artisans quickly established a common language dealing with chambira palm fiber and other plants used in making woven crafts. 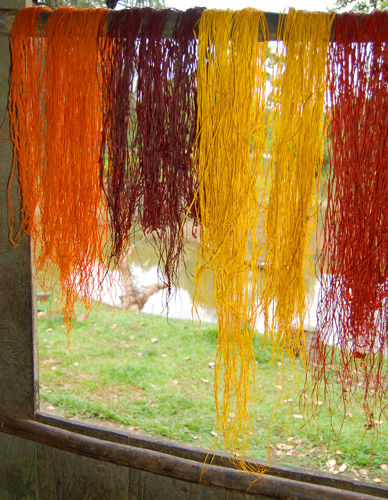 There was no doubt they could make the kind of baskets we wanted, but it took a patient dialogue to sort through which dye plants they had available to make certain colors and which colors we should avoid using in our initial designs unless we wanted to provide artificial dyes from the city. Our discussion about pricing for the baskets was uncomfortable for a time because their scale was different than other villages we have bought similar products from. 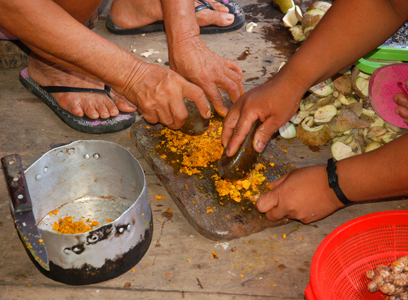 While the Maijuna were all familiar with the basic uses of copal resin – burning it for light or boiling it to caulk their canoes, they were fascinated to see and hear the stories about the intimate relationships that copal resin exuding from the trees has with various weevils, flies, ants and bees. 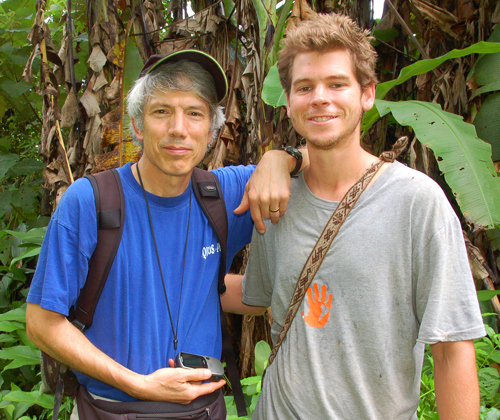 For two days I accompanied Shebaco and rotating four-man teams from Nueva Vida to search for copal. We had most luck finding large fresh lumps on trees on or near the tops of little hills and spent the other half of our time slogging through swampy low lying areas. 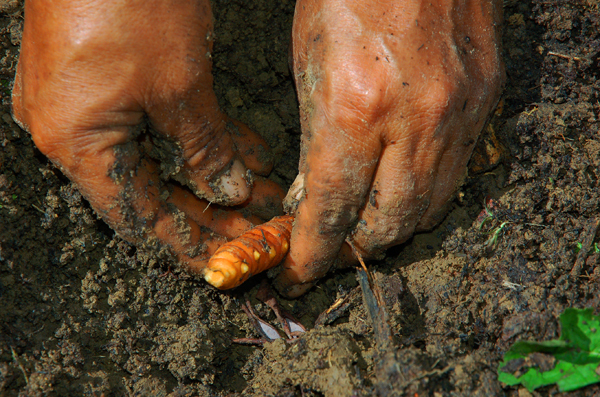 Harvesting a lump was sometimes as simple as cutting it off with a machete at chest height. A team member lashed his machete to a pole and thrust the blade under lumps that were attached to the trunk ten to twenty feet from the ground. In a few cases, a spry Maijuna wrangled his way up a nearby small tree or vine to get at some lumps that were twice as high. Two men tried to catch the dislodged lumps below (in Tulio’s long-sleeve shirt the first day and an old cassava carrying bag on the second) while trying to keep dry resin bits from falling in their eyes. The teams quickly adopted our protocol of not harvesting small fresh resin lumps so the weevils inside them could mature and stimulate more resin lumps in the future. They also understood that while they could take old black lumps back to their homes to stoke cooking fires, the dry odorless lumps were not worth distilling because they had lost most of their essential oil. 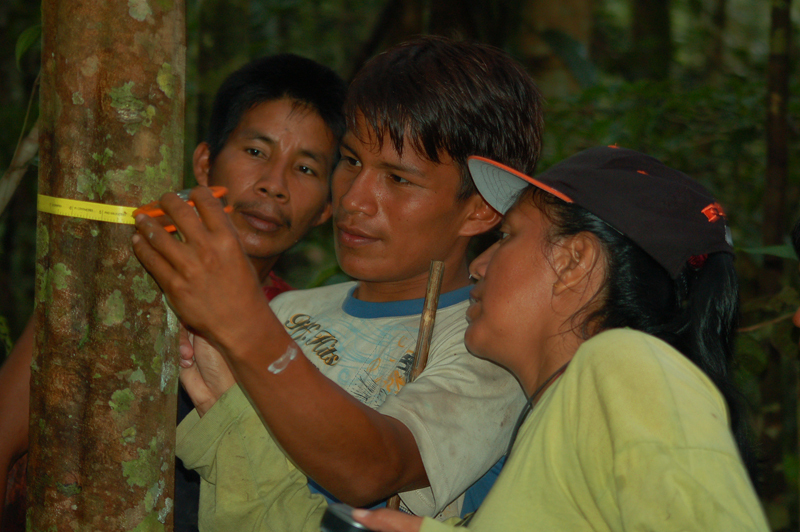 We collected GPS points at all of the trees to aid in finding these trees again in five or six years and combine them with satellite landscape data to help identify other good sites for finding copal trees in more distant Maijuna forest areas. 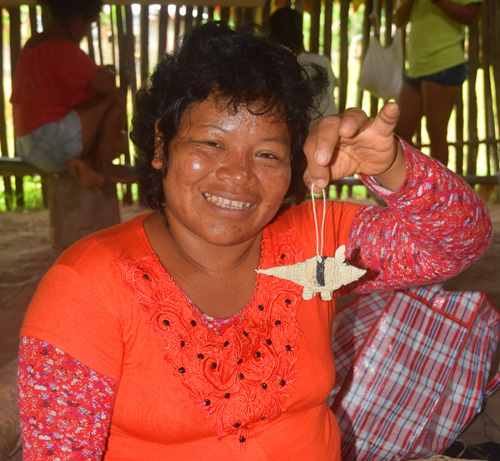 Other highlights of my time in Nueva Vida included fishing with Shebaco and Everest and meeting Elena, an artisan who had woven a beautiful river dolphin as a sample keychain. 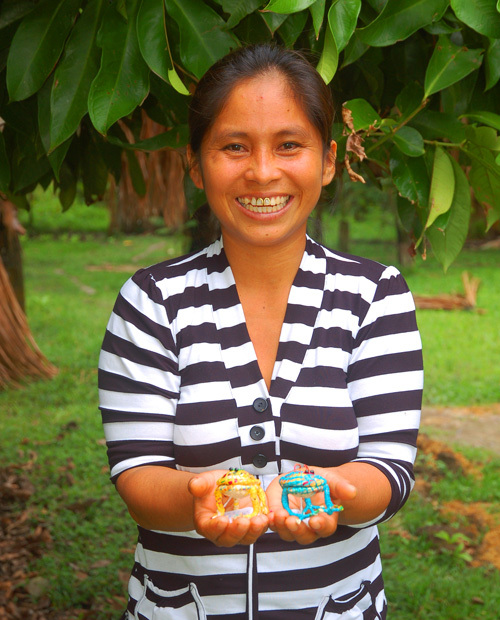 After Tulio talked with her, I commissioned her on the spot to make fifteen more as Christmas tree ornaments. I was impressed that Tulio was able to sincerely engage with people who are understandably often very shy in this situation to become comfortable enough to share something about their craft making and other aspects of their lives. 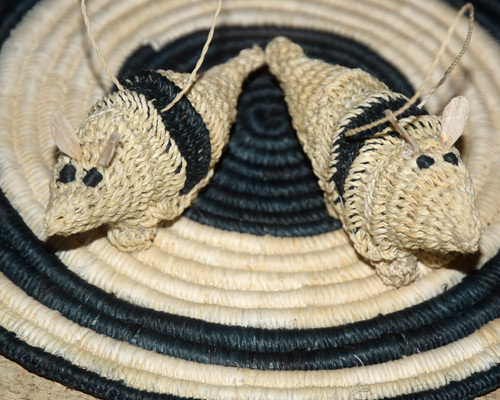 In the final hours of light, I was very happy to reach an agreement with the president of the artisan association about making an initial batch of baskets for us. Our Nueva Vida hosts were accepting if circumspect in sharing their evaluation of our visit with us. 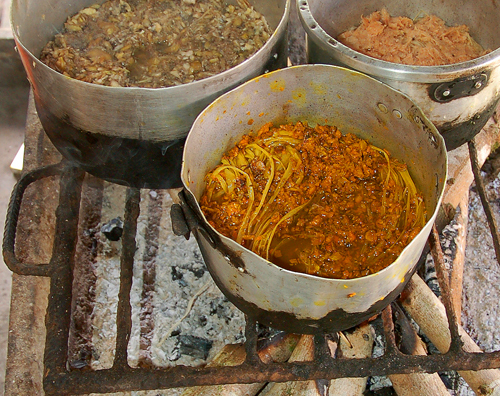 Every community in this region has had multiple experiences with visitors from various groups coming in to pitch one project or another – many of which lack follow-up or don’t go well for other reasons so I understand why they temper their enthusiasm for a new venture until it proves worthwhile. I already felt a bond with Shebaco, but I was encouraged that several people from Nueva Vida asked me one and only one simple question: “When are you coming back?” So the dance has begun. I hope to see thirty beautiful baskets in three weeks as the next step. 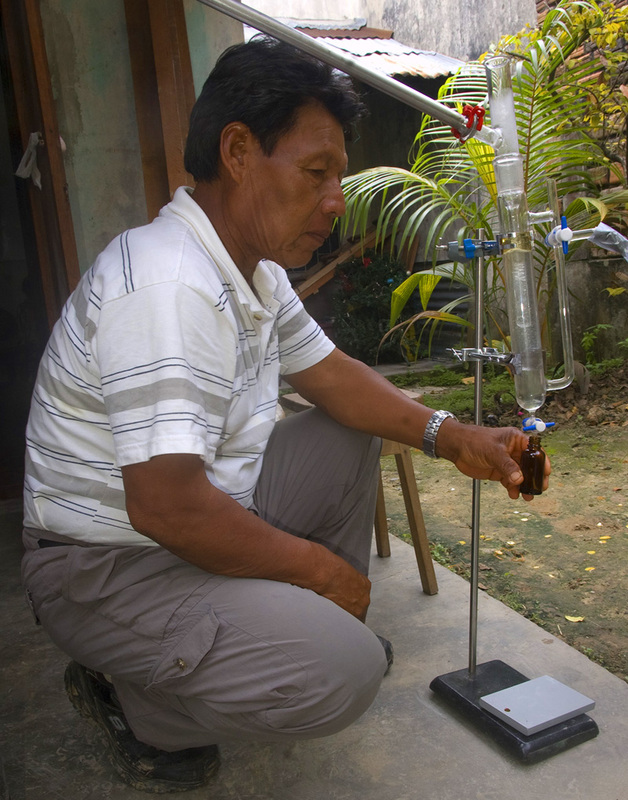 Back in Iquitos, our project manager Yully set herself to the task right away of distilling the resin collected at Nueva Vida. 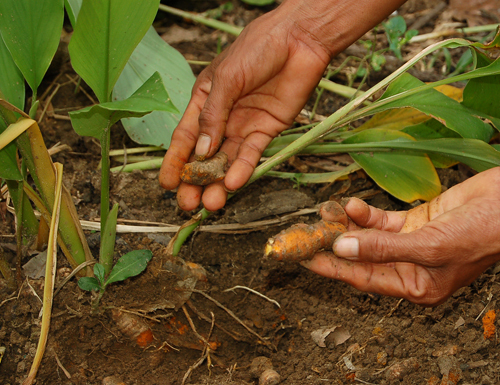 It was great to learn that it shared the highest yield of essential oil we have produced so far from any region. Analyzing a sample of it will help determine its composition and commercial potential. If these aspects prove positive as well, the next step will be to formulate a management plan to guide the development of this local enterprise in the years to come. I’m excited to be leaving for Iquitos today. 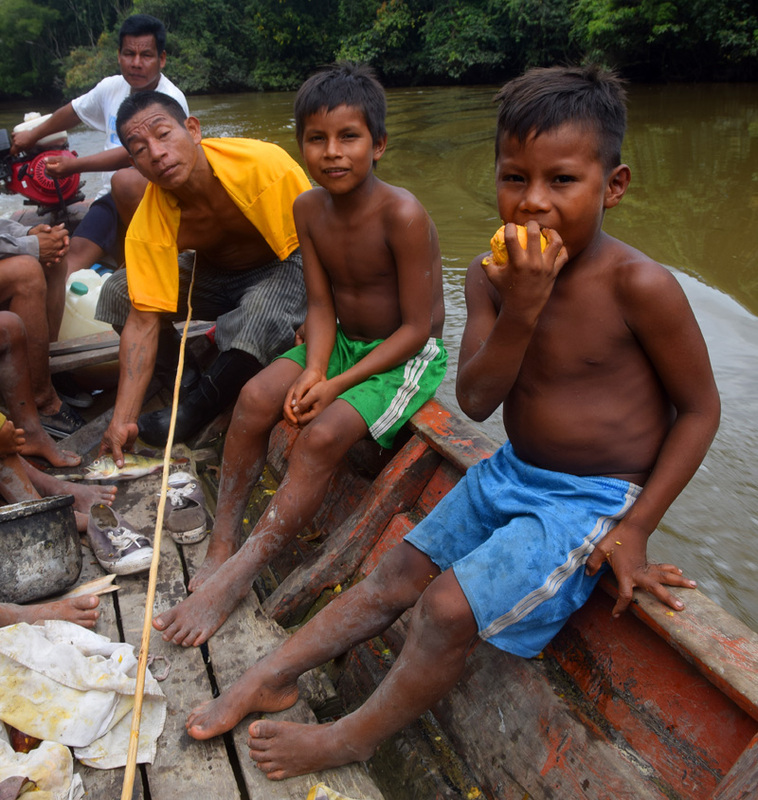 It will be in the middle of the rainy season when both tasty Amazon fruits and mosquitoes (with and without malaria) are abundant. I’m ready, though, because I get to spend a whole month away from the coldest winter I remember after living in central Pennsylvania for almost 20 years. The snow has been pretty, but repeatedly freezing my fingers and toes while shoveling my and a neighbor’s driveway has grown tiresome. 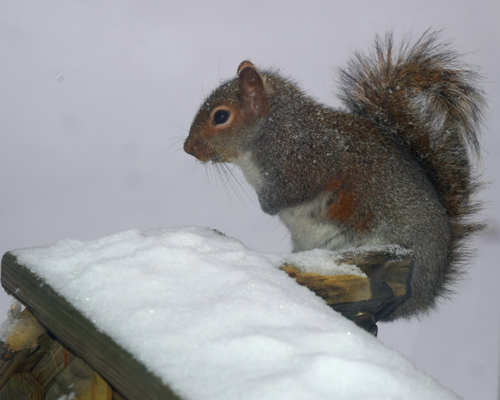 As I started packing two days ago, I saw a squirrel perched on the hand rail of our back porch with her tail curled onto its back giving it a Mohawk look. As she looked at me through the window, I wondered if she was just curious about me or wanted to come inside for a reprieve from the extra chill. I donned five layers to walk my lab-mix Juno, but I did smile when I saw her running with her head lowered to plow fresh powder into her open mouth. It reminded me of a black skimmer slicing through the ocean surface with its open beak to scoop up tiny fish. I’m also excited about spending a month to advance CACE projects in Peru. It’s hard to believe we are now nine years old! 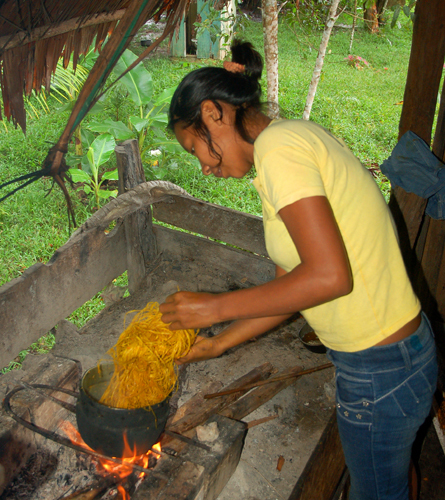 I will again visit the native villages of Brillo Nuevo and Puca Urquillo where we are doing back to back workshops to help 80 Bora and Huitoto artisans learn to make popular models of hot pads, belts and ornaments. I also want to ask them about their goals for their families and communities to gauge how much time they really want to invest in craft-making compared to other ways of making money and tasks of daily life. 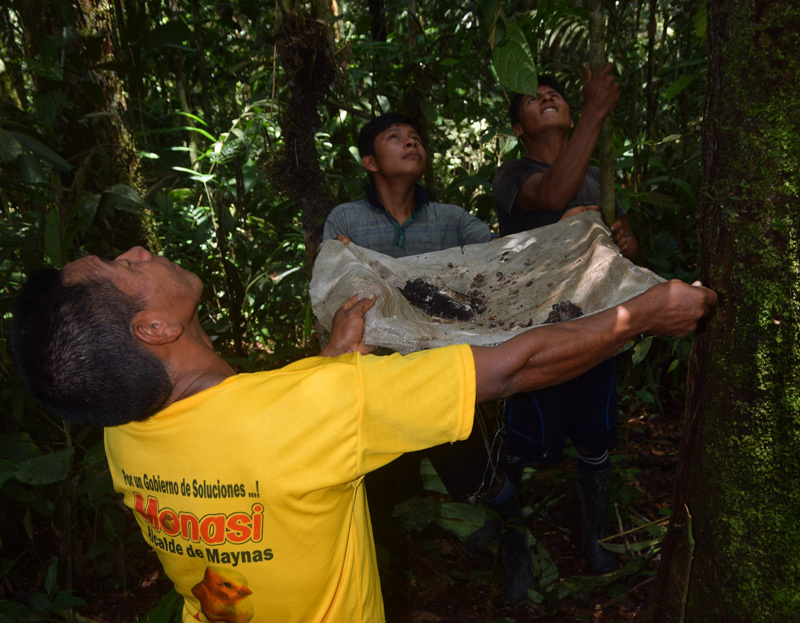 I’ll return to Jenaro Herrera to begin winding down our basic research on the ecology of copal resin as we apply results from these studies to help our community partners sustainably harvest resin from their forest and distill it to marketable essential oil. 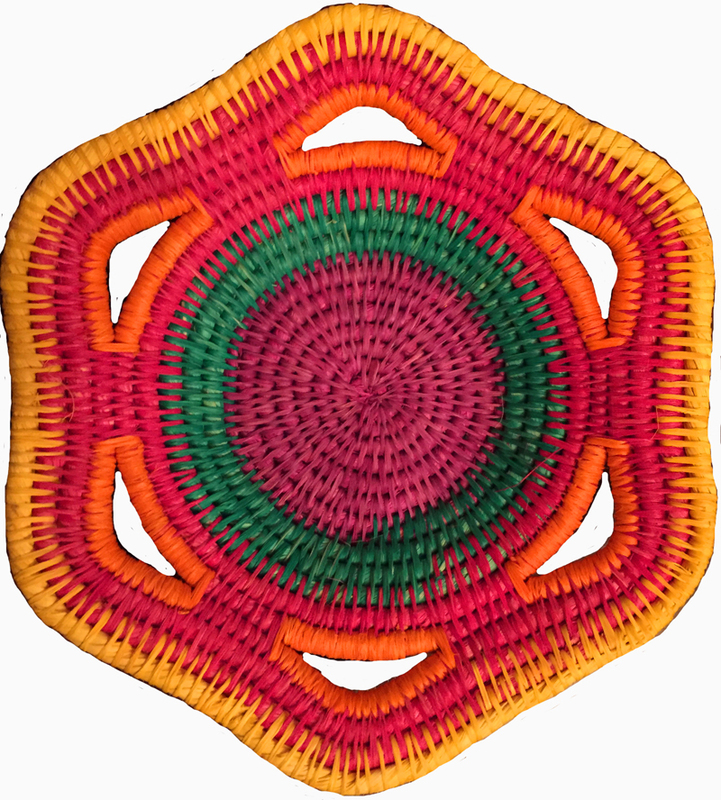 I’m looking forward to seeing the women artisans from Chino to pick up a new batch of woven frogs whose expressions reflect their creators’ warm personalities. 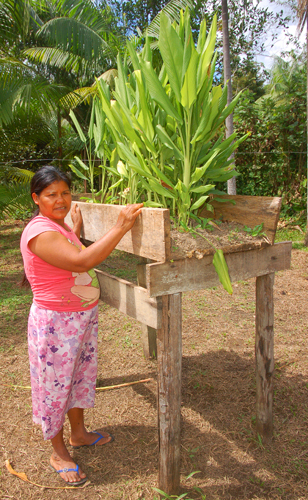 I also want to record how they’ve used CACE social rebate funds to tend young chambira palm trees planted to supply fiber for making the frogs and their signature Tahuayo region baskets. Thanks to CACE board member Michael Gilmore, I will return to the Maijuna village of Nueva Vida to help their artisans make six models of small baskets we can try to market in the U.S. I’m hoping for good health and energy since I spent several days languishing in a hammock after eating something funky at an otherwise wonderful festival. After my trips to our partner villages, our project manager Yully Rojas and I are going to host our first CACE public gathering in Iquitos. Almost 200 people who live there have “liked” our Facebook page, so we’re going to invite them to a combo presentation and little party. My hope is that we can start to kindle local and interest and support for our project with the people who live in the heart of the region. 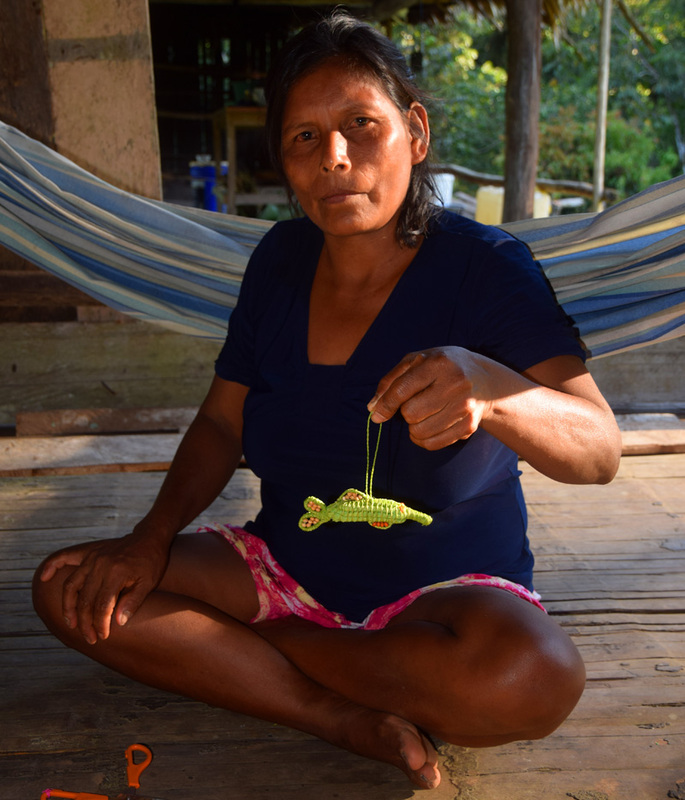 Near the end of my trip, we will welcome Tracy Stayton to a CACE Amazon Field Volunteer for ten days as part of her remarkable Thirtyfourtunate project. 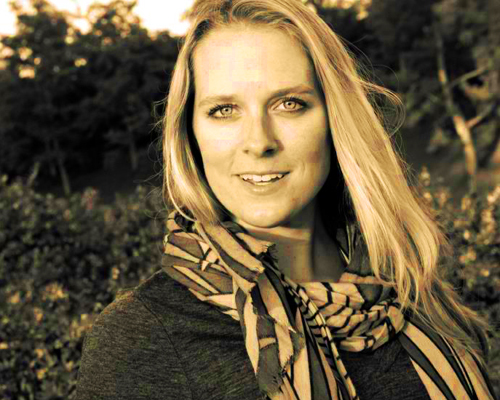 Having turned 34, Tracy has begun a year-long global giving adventure when she will do 34 acts of service to give back and bring awareness to NGOs and their causes around the world. Follow her journey at: Facebook.com/34tunate. Thank you to my loving family and many friends for your warm wishes as I head south again. May you enjoy the winter outside as much as you can and savor a cup of hot tea when you come back inside. I also offer thanks to the Rufford Foundation, New England Biolabs Foundation and GlobalGiving Foundation for support of our work in Peru. Please visit wwww.AmazonAlive.net to support our proect. 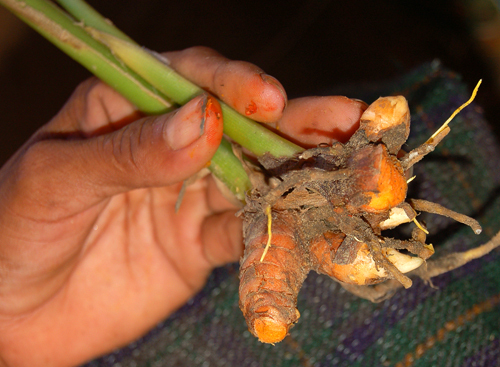 Curcuma longa is a herbaceous perennial plant in the ginger family (Zingiberaceae) whose rhizomes (roots) are used to dye fibers and foods yellow and to make a spice/medicine (turmeric). 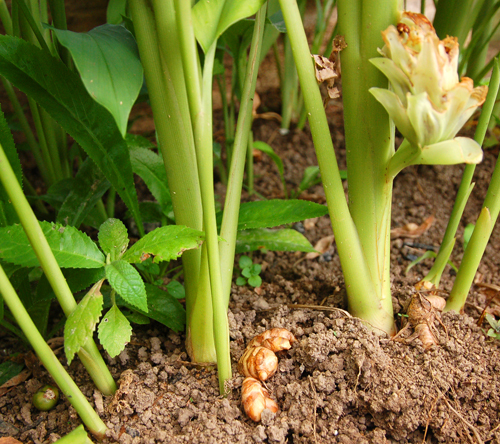 The plant originally came from India, but it is now widely used as well throughout the Amazon. 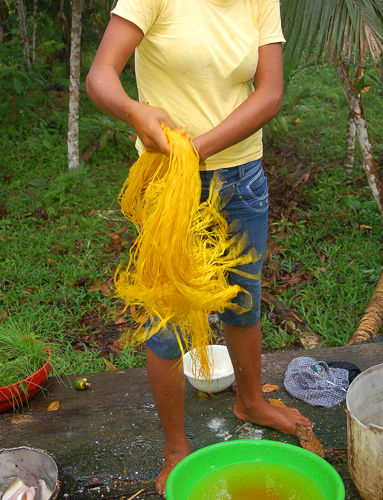 Native and campesino artisans from Peru usually call this plant “guisador” and use it to transform white chambira palm fiber to a range of shades from bright yellow to deep mustard. 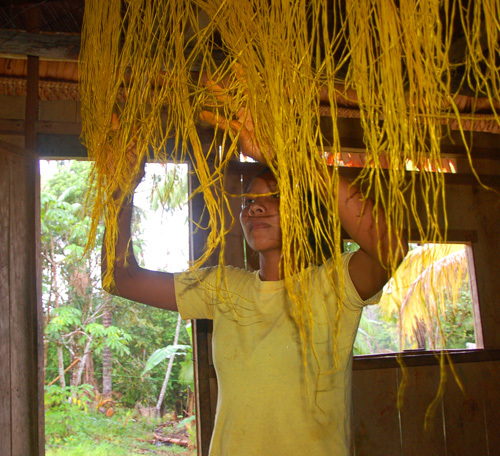 Below is a photo essay showing how our partner artisans from four communities plant, harvest, and process this versatile root to dye chambira and weave its fiber strands into beautiful handicrafts. 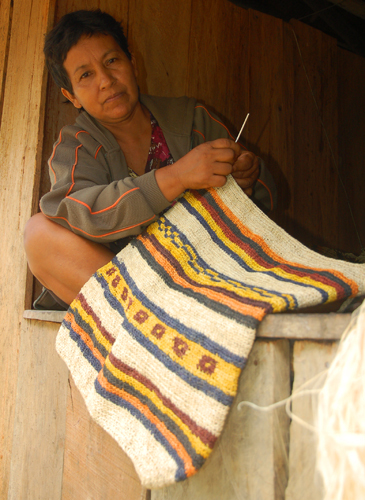 See photos of handicrafts made by Peruvian artisans that may be purchased from the Center for Amazon Community Ecology on our Facebook photo album page. 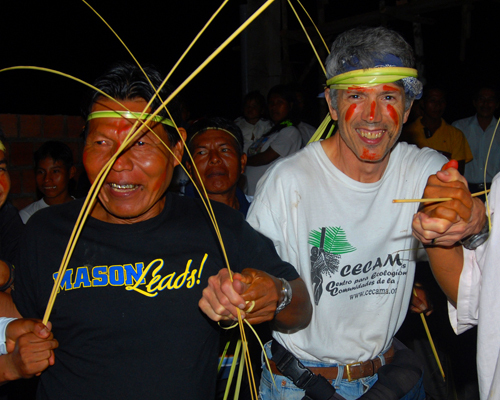 The Center for Amazon Community Ecology began like many non-profit organizations – it had one person with few resources and a big dream about making the world a better place. 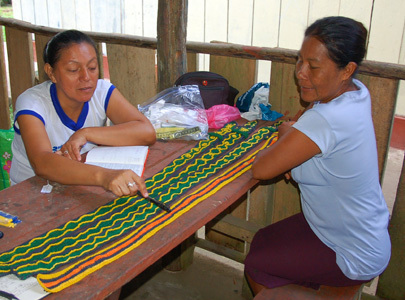 I wanted to conserve the Amazon rainforest by helping native people to improve their livelihoods and communities by selling innovative non-timber forest products as alternatives to economic activities that damage the forest. 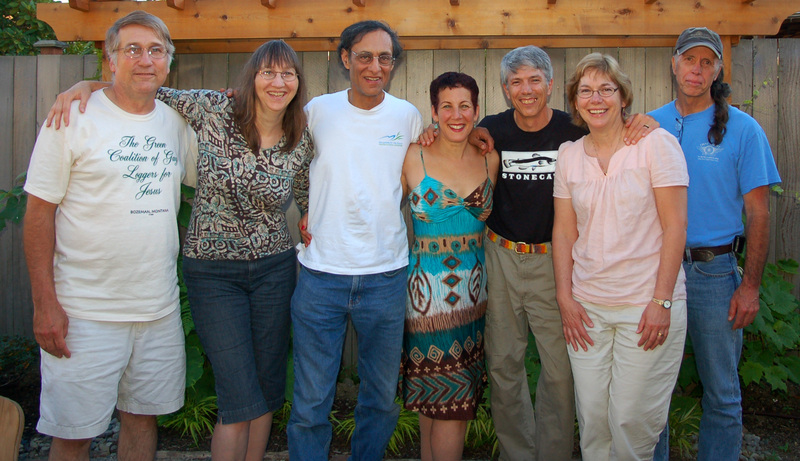 Our early work was supported almost entirely with the support of a few friends, family members and foundations. Campbell Plowden and Robin van Loon at Baltimori. Photo by CACE. We gradually expanded our presence on the web, but did not get many donations through our website, Facebook or blog. So in 2012, I started exploring a variety of crowd-source platforms. Kickstarter seemed great for hot business ideas, but wouldn’t work for non-profits. Indie-gogo offered a space for non-profits, but these seemed lost in their mix, and every project had to meet a funding target with a short fixed deadline. Network for Good offers great resources to non-profit groups to raise their profile and funds, but it lacks a central site that attracts visitors interested in supporting a cause or project. 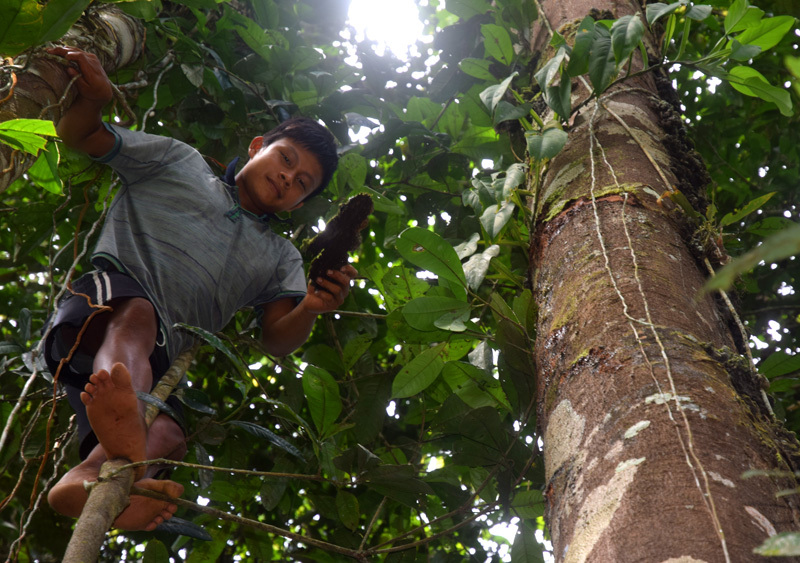 Robin van Loon from a partner group Camino Verde told me that his group had received extensive support for his work reforesting native trees in southern Peru through the GlobalGiving network so I decided to give it a try. GlobalGiving is a non-profit organization based in Washington, DC (with a sister group in London) that provides a dynamic platform for other non-profits to raise funds for specific projects that benefit people and/or the environment. GlobalGiving keeps a 15% commission instead of the 5-10% taken by most other platforms, but being part of the GlobalGiving network offers a lot more than a simple mechanism to channel online donations. It offers its partners valuable tools and a place in a community that fosters open communication and mutually supportive relationships between the people in the group, the people that it serves, the people that fund its work, leaders of other groups in the network, and the people who work in GlobalGiving. 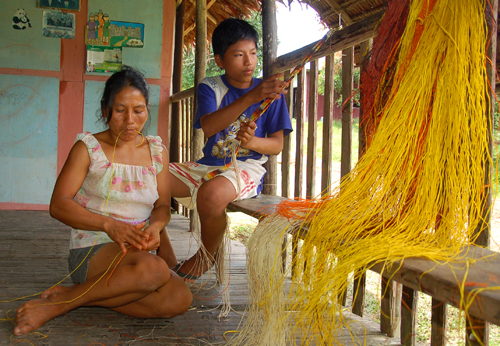 Playing an active role in this community has significantly increased the number of donors and quantity of donations to our work in Peru and strengthened the quality of our communications and relationships with our partners in remote villages and supporters at home and abroad. Getting onto the GlobalGiving platform is a multi-stage process that begins by proving that your group is a bona-fide non-profit organization with tax-deductible status (501-c-3) in the US or equivalent status abroad. An applicant also needs to describe its track record and provide several letters of recommendation. After passing this due diligence process, a group can take part in an Open Challenge to earn a permanent spot on the platform by raising at least $5000 from 40 or more donors in one month. The prospect of raising this much money from so many people in one month seemed very daunting to me, but I decided to go for it in a challenge that began in late November, 2012. I began by contacting everyone in my universe and asking them to contribute any amount they could. I sent appeals to high school classmates, former colleagues at Greenpeace, and family members far and wide. 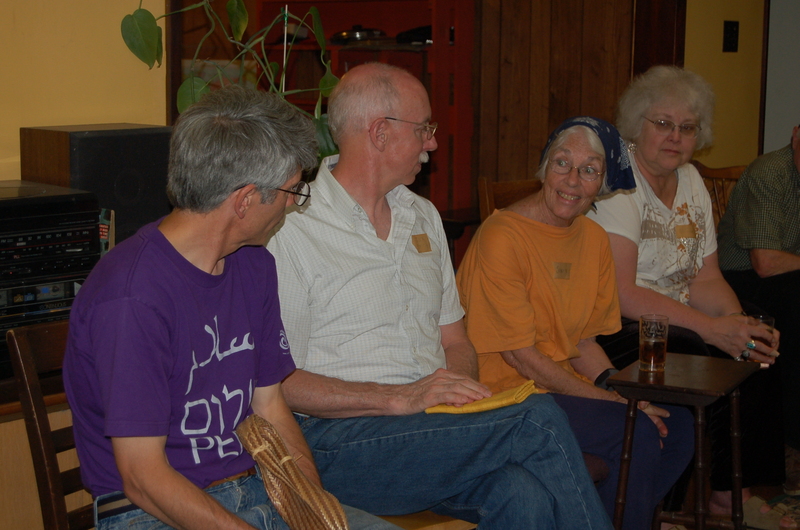 I arranged to do presentations at church groups and homes of a few supporters who invited their friends. I wrote short pieces and posted photos on our website, blog, Facebook pages, and Twitter. I asked a few prospective larger donors to make their contribution on Bonus Days when donations were given a 15% match. By December 31, I was thrilled that we had raised almost $8,100 from 65 donors and matching funds from GlobalGiving. When the challenge was over, I took some deep breathes and looked carefully at the data provided by GlobalGiving to see which outreach strategies had been the most effective for us. Not surprisingly, most of these funds came from my friends, family, or others I met through a friend. What was encouraging, though, was that many people who had known me and my work for years made their first donation to my group during this challenge. Being on GlobalGiving gave my group extra credibility and me the confidence to ask them directly for support for the first time. My friends understood that helping my group earn a spot on the platform would eventually give my group a good chance to receive support from many new people. 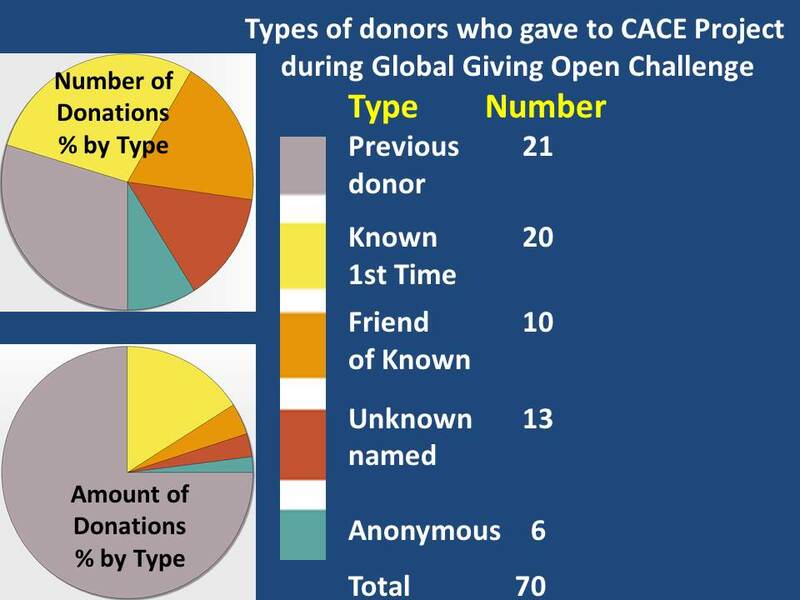 While CACE raised far less than the top earners during the Open Challenge, my frequent questions to GlobalGiving via phone, email and webinars caught the attention of a few staff people. A partner associate soon asked me to share my experiences and analysis in a webinar with groups who were considering participating in the next Open Challenge. Since last January, I have participated in almost every webinar and special campaign that GlobalGiving offers its partners including a free two month long online fundraising academy. These lessons, contests, and feedback from GG staff have tremendously helped me improve the proposals, progress reports, thank you letters, photos, videos and social media posts we share with past and potential supporters. GlobalGiving also offers its partners great tools and encouragement to improve their communications and relations with the people they aim to serve. 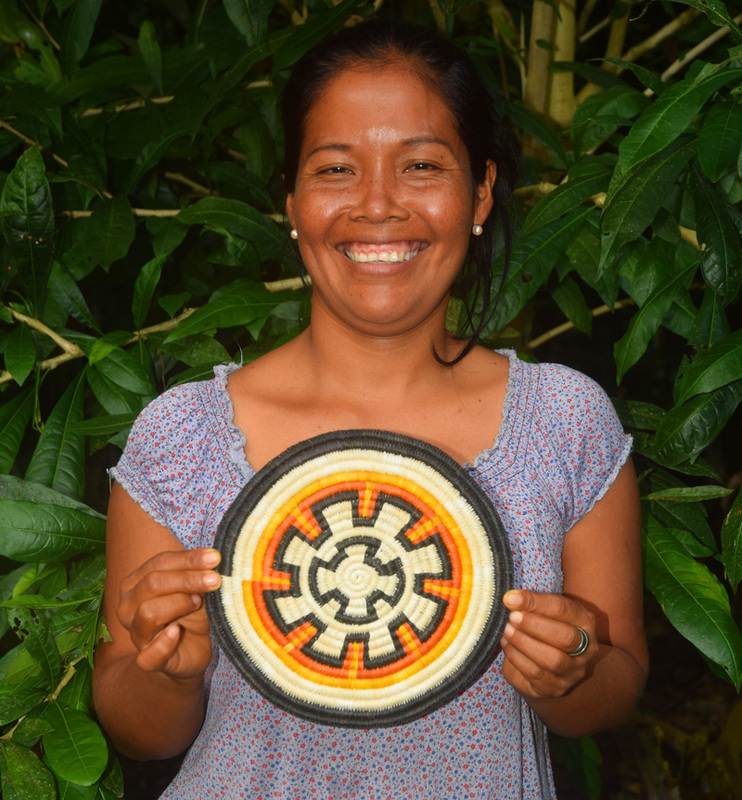 As we strive to increase artisan income with new products, we are learning how to better incorporate traditions and cultural realities into the process. 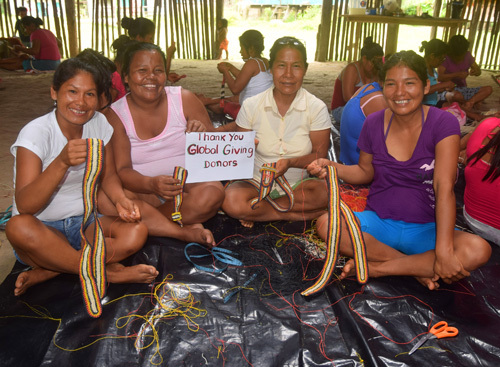 A GG volunteer visited our most remote village in the Peruvian Amazon with us to see how we were doing. 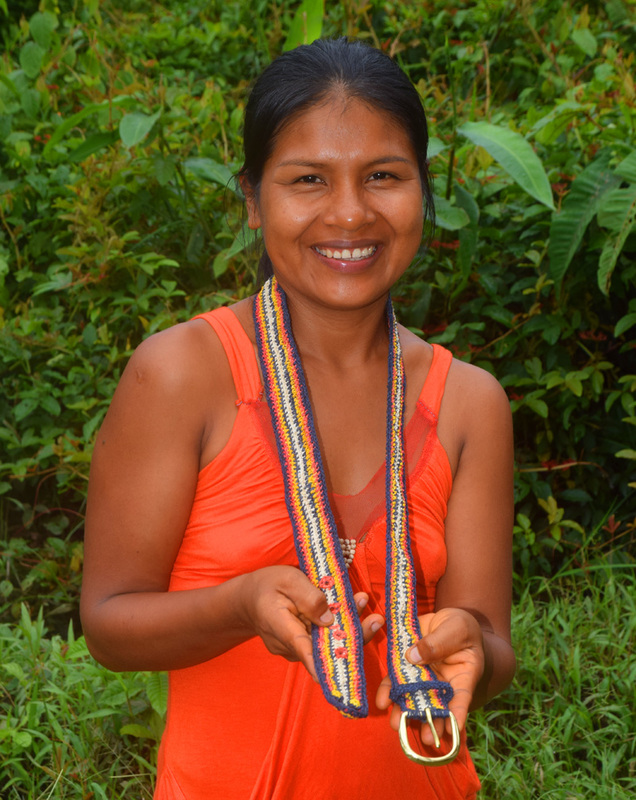 When she witnessed our project manager Yully in the thick of a difficult conversation with an artisan partner, she offered her empathy and encouragement rather than judgment. I am now looking forward to trying out the new GlobalGiving Storytelling tool with our partners in eight villages this summer. 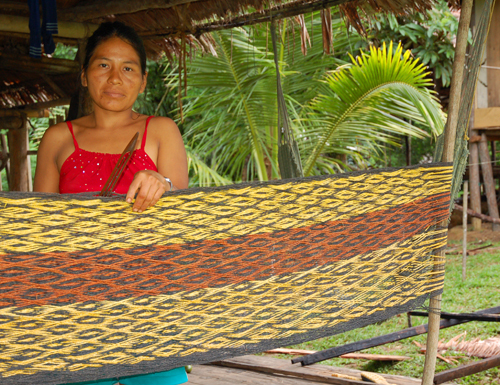 Beyond its standard offerings, GG has directly supported our sale of handicrafts made by our native partners in Peru. 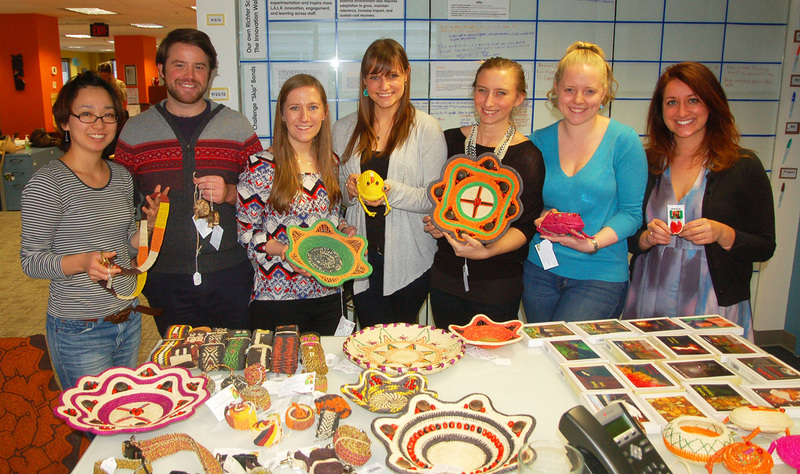 These efforts have included featuring our crafts in their Gifts for Good program, bringing back a batch of our crafts from Peru to the U.S., buying 125 hot pads which they gave to a group of special donors, welcoming us to sell crafts to their staff people in their office around Christmas and inviting us to sell crafts at a big conference about corporate volunteerism in Washington, DC. GlobalGiving continually encourages groups on the platform to seek input from and listen to their supporters and beneficiaries, and it passionately applies this practice to their dealings it partners. Companies now routinely solicit feedback from their customers in surveys, but it is clear that GlobalGiving is not following a rote corporate mantra. As I participated in one webinar, campaign and Leadership Council meeting after another, it became apparent that every person I interacted with from GlobalGiving genuinely wanted to know how they could improve their site and programs and then actually used partner ideas to do so. I now think of GlobalGiving more as a “they” than an “it” because GlobalGiving staff people including Alexis, Britt, Katherine, Sonja, and Mari seem to truly understand CACE and want to help us succeed. Their commitment has inspired me to try and help GlobalGiving help other groups do their important work as well. 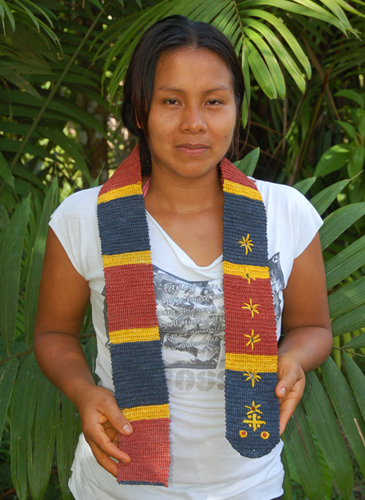 As of We have now raised $25,248 for our Peru project on GlobalGiving. Crossing the $24,000 threshold gives a group “SuperStar” status on the platform which gives groups greater visibility, opportunities with corporate partners, and a 50% match on donations on Partner’s Bonus Day coming up on July 16. 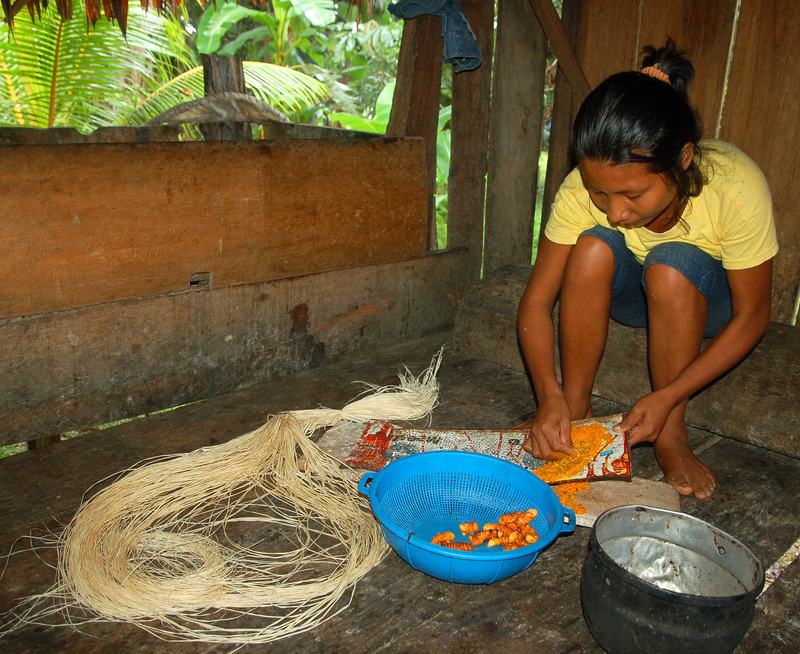 Thanks for contributing any amount you can to help us help our partners in Peru and save some Amazon rainforest? 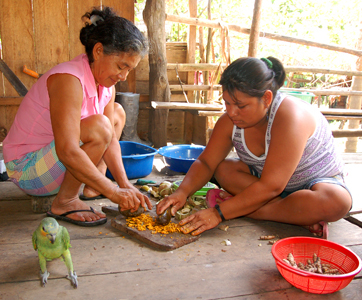 Check out our project on GlobalGiving at: www.AmazonAlive.net.